A few weeks ago, we paid a visit to our Kaweco distributors out in Burlington (more on that to come soon! including photos! ), and it was great to see and hold and feel some of Kaweco pens we don’t regularly carry. We saw some real beauties, including the Kaweco 1910 Eyedropper ($550 CAD), which I am hoping Jon may one day get me for Christmas. 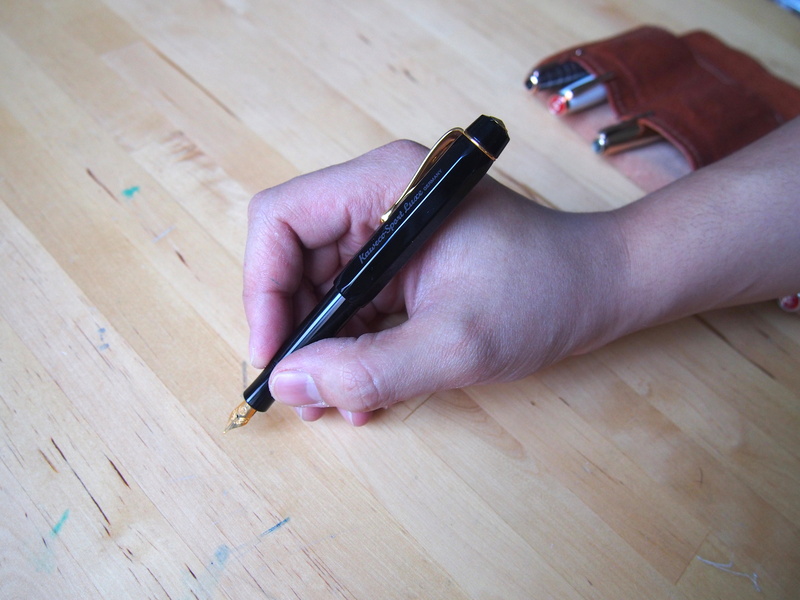 We did, however, pick up the last eight of the Kaweco Sport Luxe Fountain Pens! Jon is always a bit reluctant to bring in pens that have such limited stock, since you do all this work taking pictures and promoting it, but you only have a handful of pens, but I knew as soon as I held it in my hand that I had to have one – and of course I need to blog about all my new acquisitions. Jon figured if I was going to blog about it, we might as well bring in the remaining stock. 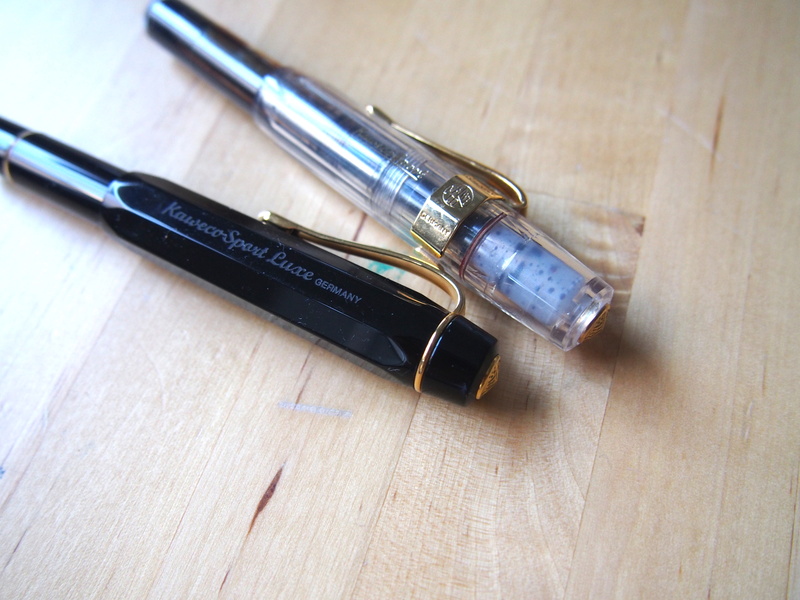 I am a big fan of the Kaweco Sport, even with the slightly-difficult-to-use squeeze converter. In fact, the Sport was one of the first pens we ever carried. The size and the design and the weight of it is just right for me. I love converting my pens into eyedroppers, but I also use cartridges every once in a while. I have more than a few Sports, but I use my clear one the most, because I can eyedropper it, and because the fact that it’s eyedropper-ed means I have a ton of ink it in so it’s always “in use” (i.e. it takes so long to run out of ink that it’s months before I clean it out). 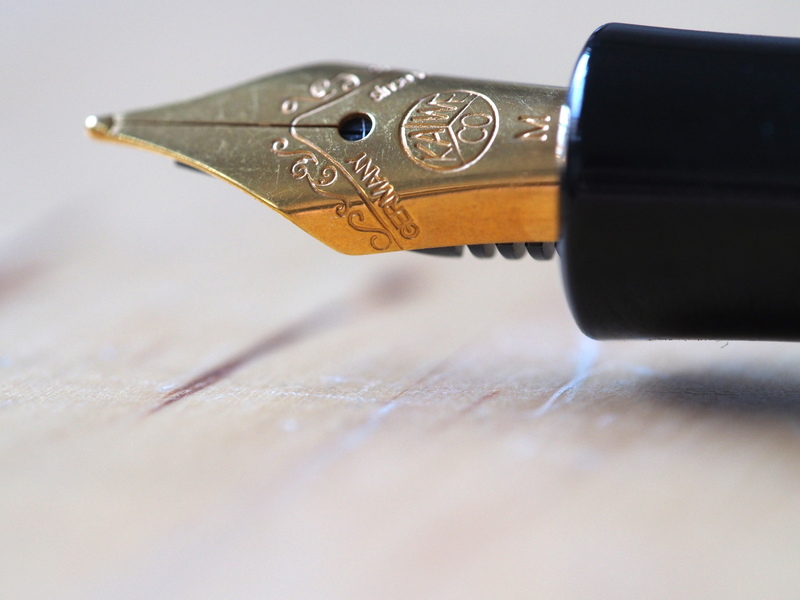 The Kaweco Sport Luxe fountain pen is basically what the name implies – the luxury version of the Sport fountain pen. It’s identical in shape and size to the Sport, but it’s got a few nice upgrades for the true Kaweco Sport fans (like me). If you know the Sport pen design is definitely for you, this higher end version would be perfect for you. It has the same length as the Sport, that is a bit more manageable, especially if you have larger hands, if you post the cap on the back when you’re writing. The first big difference is that the Luxe is made out of acrylic rather than the ABS plastic on the regular sport, and the finishes and trim are gold-plated brass. The second big difference is that the clip is integrated into the cap, so you won’t be able to remove it, and it also won’t slide around on you. Additionally, it has a band around the end of the barrel. The etching on the side of the barrel is also a bit nicer – it’s a grey, clean etching, that’s a bit subtle and harder to see unless you look just right. I feel like the integrated clip and the etching make the pen look a bit more vintage in style than the Sport, although the Sport also does have a vintage flair to it. The brass ring in the barrel and the brass in the integrated clip also make the Luxe just a touch heavier in the hand, although not so much so that it’s really noticeable unless you’re thinking about it. Unfortunately, this pen only comes in a medium nib. 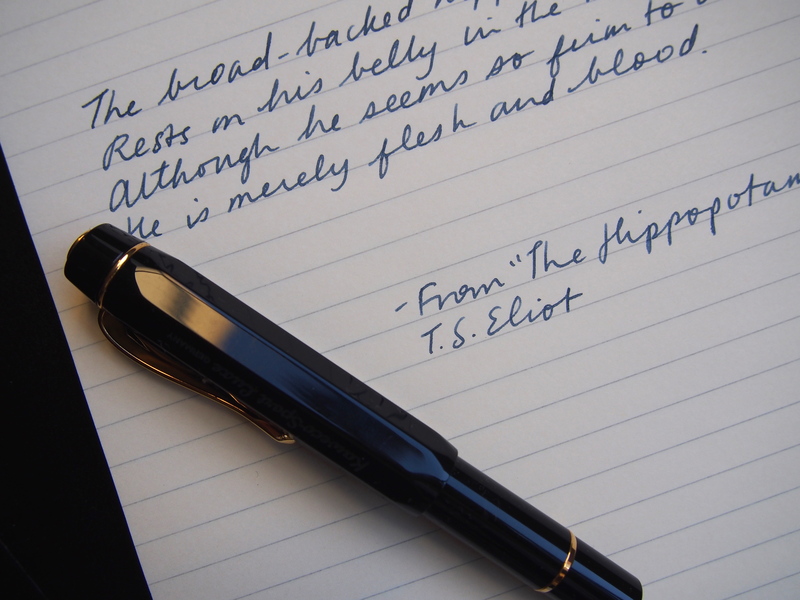 The nib is a steel nib that’s gold plated, but it seems to have a slightly darker hue to it, I think maybe to match the clip and the trim, which is just the slightest bit deeper than the standard gold clip that’s removable for the regular Sport. However, it’s the same 060 size nib so you can exchange nibs with other Sports or Students or Al-Sports, etc. For me, the biggest downside to this pen is that I don’t think you can convert it into an eyedropper. I used a flashlight to get a closer look inside the barrel, and I think the trim that goes on the end of the barrel is metal and visible from the inside. Ink can sometimes react with metal with direct contact, so converting to an eyedropper is probably not a good idea. As someone who has long loved the design and shape of the Kaweco Sport, I couldn’t resist getting the higher quality version of the Kaweco Luxe. Jon sometimes says I can scammed too easily – “it’s about to be discontinued” has been the final nail in the coffin of many, many purchases – but I really couldn’t resist. A pen I already love, but in a suped up and now discontinued version?? Haha. I saw it in the display and had to have it once I held it! It’s a shame this is being discontinued. If Kaweco could only innovate a converter for the sport that wasn’t so frustrating. Even just a long plastic empty cartridge that I could fill with with a syringe would be aces. Amazing pen though and it was great seeing you both today:) Can’t wait to try out the elite I ordered as well. I completely agree! 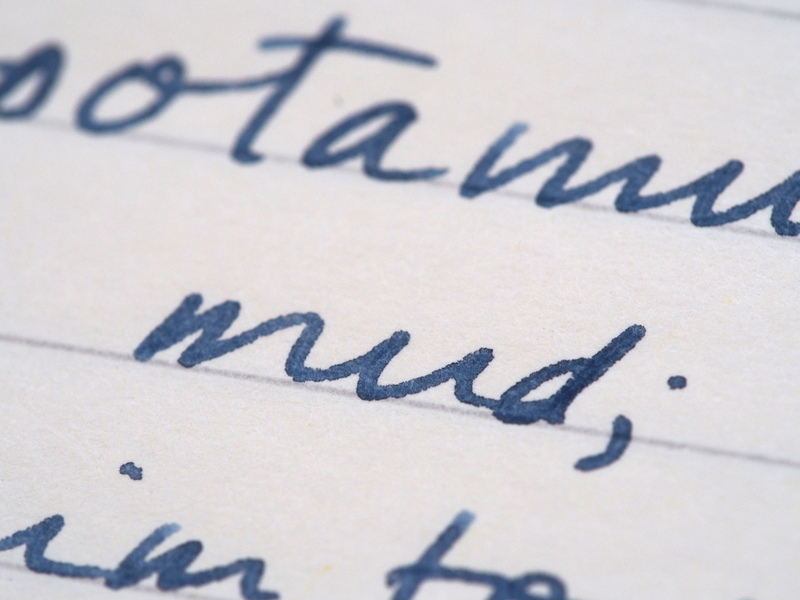 When people new to fountain pens ask between the Sport and the Safari, I always have to say the Safari’s big advantage is that it is much easier to use bottled ink.